Quaker Voluntary Service Staff Team- Meet the members! Hilary has been with Quaker Voluntary Service since January 2015, seeing three cohorts of Fellows through the QVS program. Hilary’s desire to deepen and grow the work of transformative experiences for young adults energizes her as she steps into the Executive Director role. Hilary sees QVS as an integral component of the Quaker movement the world needs now, and is excited about continuing to build our community of support nationwide. Hilary grew up in Acton Friends Meeting (MA), participating in the New England Yearly Meeting youth programs from elementary through high school. After graduating Oberlin College in 2010 she moved to Boston. In the years since she has worked on farms, for environmental groups, and for New England Yearly Meeting. Hilary attends Beacon Hill Friends Meeting, lives in Jamaica Plain, and wears a helmet when she bikes around Boston and beyond. Christina grew up in the Charlotte Friends Meeting and is now a member of the Atlanta Friends Meeting (Southern Appalachian Yearly Meeting and Association). She has served on staff in the Peace Building Program of the American Friends Service Committee, Southeastern Regional office. She previously worked out of AFSC’s Philadelphia office as the coordinator of the Mexico Summer Project, one of AFSC’s last remaining workcamps for young adults. She served on Friend’s General Conference’s Youth Ministries Committee for 6 years, and recently served on FGC’s Stoking the Spiritual Fire of Quakerism Capital Campaign Steering Committee. She was a Woodruff Fellow at Emory University’s Candler School of Theology where she received a Master of Divinity in 2011. Her masters thesis was entitled “Prophetic Service: The Roots of and New Directions for a Quaker Religious Practice.” Following seminary, Christina served as Program Coordinator for the Faith and Service Program of the Cousins Family Foundation, where she worked with a national network of faith based voluntary service programs and with the Fund for Theological Education’s Volunteers Exploring Vocation program. She has carried the leading to create QVS for many years and is thrilled that it is finally coming into being. She serves on the Board of Directors of Friends Fiduciary Corporation and the advisory board of Peace Builders Camp at Koinonia Farm. Her writing has appeared in Friends Journal and Quaker Life and she has been the invited speaker at various events including the 2014 Philadelphia Yearly Meeting William Penn Lecture and Guilford College’s 2014 Commencement Exercises. She lives in Atlanta with her husband, Dean, who is the founding principal and executive director of the Kindezi School, and their two spirited children. If Mike ever gains access to a time machine, he will set course for the 17th Century and follow Mary Fisher through the Ottoman Empire. Mike found his spiritual home with the Quakers at the age of 18. This came as a surprise to everyone (himself included). After earning a philosophy degree from Portland State University and a Master of Divinity from Princeton Seminary, Mike helped start West Hills Friends in Portland, OR. After 30 years of pastoral ministry, he’s excited to begin a new chapter of life with QVS. He has a magical daughter and a highly capable wife. His brilliant son died in 2014, which simply broke his heart in two. He believes in fresh donuts, a sense of wonder and the fearless pursuit of love; but the greatest of these is love. Lee Anne previously worked for QVS in a part time capacity, and is thrilled to rejoin QVS as Director of Operations. In her (long ago) college days, she devoted most of her extracurricular time to service projects, and has always had a volunteer spirit and desire to help make the world a better place. Lee Anne graduated from Trinity University with a degree in Economics and French, and spent the majority of her career at a large management consulting firm where she gained experience in organizational operations improvement. After a brief stint pursuing a graduate degree in cell biology, she ultimately decided to stay home with her young daughter for several years. QVS provided the perfect opportunity to re-enter the workforce and use her talents for good. In her spare time she enjoys hanging out with her amazing family, decorating cookies, and taking an occasional trapeze class. 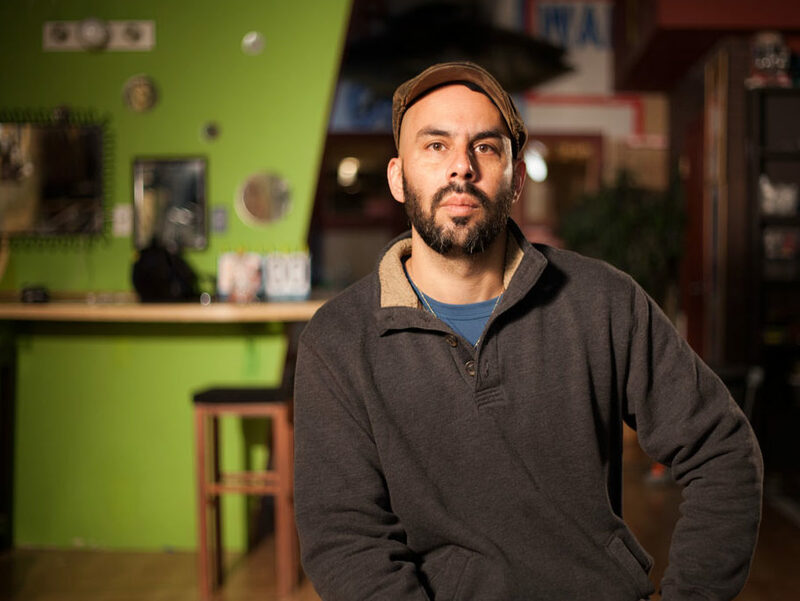 Oskar Pierre Castro is an artist/analyst/non-violent activist/father & husband with over twenty years of service in the nonprofit sector working on youth development, career development, peace activism, and labor rights. Oskar is a 1992 graduate of Rowan University where he majored in Law & Justice. The human rights part of the Law & Justice curriculum stimulated his belief in the need to work for social justice when it is absent. Oskar’s nonprofit experiences include things like leading a national office program at the American Friends Service Committee and helping talented youth-of-color navigate corporate America with INROADS, Inc. A member of Central Philadelphia Monthly Meeting, he is originally from South Jersey. Oskar moved to Philadelphia in 1994, and as a multi-faceted artist there he employs music, poetry, and graphic art to creatively communicate his ideas about the world. Oskar is married to a like minded soul, has two awesome children, the best dog ever, and the cutest maniacal cat in Southwest Philadelphia. Liz Nicholson grew up in West Richmond Friends Meeting and began worshiping with First Friends Meeting in Richmond, IN as a young adult. Liz graduated from Guilford College in Greensboro, NC majoring in Psychology and Music and participated in the first QVS house in Atlanta in 2012, where she became active in Atlanta Friends Meeting. Professionally, she has worked with adults and children who have intellectual disabilities, utilizing her combined passions for effective communication and music. Her interest in social justice and activism led her to work with Friends Committee on National Legislation, several disability organizations, and work alongside Quakers in Israel/Palestine. Liz joined QVS in 2014 as the Atlanta Coordinator where her valued experience as a former Fellow brings an important perspective to the staff team. Claire grew up in Durham, North Carolina where she attended Durham Friends Meeting. She graduated from UNC-Chapel Hill in 2016. 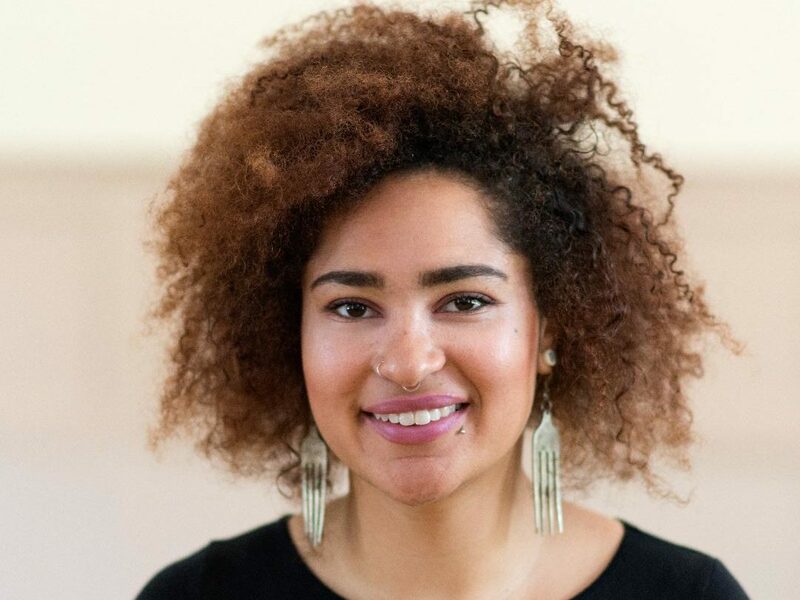 At Carolina, she was heavily involved with food justice and advocacy groups and led a campaign for more transparency and inclusive decision-making of institutional food sourcing and food accessibility. During her first QVS year, Claire worked at the Georgia Law Center for the Homeless where she developed and managed the Identification Advocacy Program, assisting individuals facing homelessness with obtaining their birth certificates. This service helped remove one of many barriers to chronic homelessness, supporting individuals so that they could secure stable housing and employment, as well as apply for additional social assistance programs. Claire found that her work with the Law Center strengthened her advocacy skills and reaffirmed her Quaker values. Yet, witnessing the impacts of systems and institutions that still blatantly and subtly inflict violence upon the lives of people of color and those in poverty, the work was simultaneously complicating her understanding of social policy and legal protection. This experience has compelled Claire to continuing to seek community in the southeast and engage in meaningful work to build structural change and inclusive policy that reaches those forced to the margins. Claire is looking forward to serving as an Alumni Fellow at Quaker Voluntary Service itself, as Outreach and Development Coordinator. Sonja is a member of Bear Creek Friends Meeting, and attends Laughing Waters Friends Preparatory Meeting in Minneapolis. She studied English literature in college, served in the Peace Corps in Nepal, then completed a Master’s in Education at the University of Minnesota. True to her Minnesota roots, Sonja loves the state’s rivers and lakes. She lives in Saint Paul with her spouse, two kids, and a little grey cat. She’s glad to be part of QVS! Zenaida Peterson is a recent alumnae fellow from the Quaker Voluntary Service program in the Boston house. They are a Black queer slam poet from Atlanta who graduated from Simmons College where they began social justice community organizing in and out of the classroom. While staying connected with their QVS site placement, VISIONS Inc., an anti oppression consulting company, Zenaida is pumped to recruit for QVS hoping to get perspective fellows excited for a year of both community and personal growth while in service. Caitlin Gaylord Churchill graduated from Harvard University and spent time living and working at Findhorn, a spiritual community in Scotland. She is passionate about food as a way to build community and as a platform for social justice. Her first introduction to Quakerism was being a homesick child at Friends Camp, where she eventually returned years later as the cook. She feels compelled to feed Quakers of all ages and myriad dietary restrictions and she’s not sure why.